One more excerpt before the book is released! An hour and a half later, we pulled into the parking lot of the Lamplighter. I pulled out a compact from my purse and checked that my disguise was still in place. Juliet grabbed her keys out of her purse and tucked them into her jeans. She wore an old shirt of our grandfather’s that had been tucked away in a box waiting for my next trip to Goodwill. I adjusted her baseball cap and decided it was now or never. “Uh, sure, Ralph. That’d be awesome.” Juliet croaked. “You don’t say,” Bruce said, bored. He slid two mugs of beer across to me. I dug around in my front pocket and pulled out some money to pay. “I think I’ll do that. Come on, John. Let’s cop a squat close to the stage so I can check out that prime filet.” I grabbed my beer and swaggered across the floor. “You look and sound ridiculous,” Juliet hissed. “At least I didn’t say that a beer would be awesome. Oh my god, are we Valley Girls?” I hissed back. I grabbed a chair next to the stage and sat down. 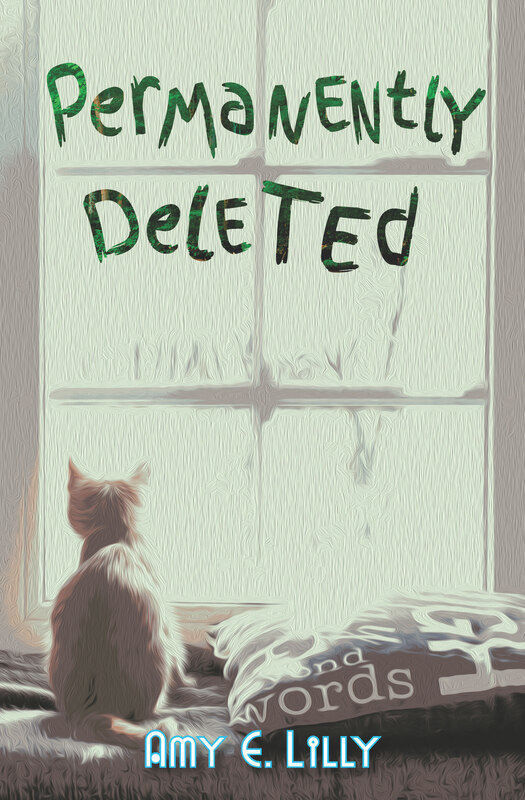 Cover Reveal for Permanently Deleted! Nicola Galliani reread the note instructing him where to go after he made it through L’Isola dell Lagrime. His orders were to meet Vanzetti in New York. The date of the revolution was set. If the people ever wanted to break the stranglehold that the crooks and hucksters of Wall Street maintained on them, he couldn’t fail. With a grim smile, he folded the paper into a small rectangle and tucked it inside the band of his hat. He slipped the hat onto his head and tilted it to hide the scarring. He needed to hurry if he wanted to make it to the ship. America waited. Thomas Sullivan looked at the Norwegian woman in front of him. Her particulars were on a landing card pinned to her dress. He verified that the information on the manifest matched the card. After a minute inspection, he gave her a curt nod and moved on to the next immigrant. He repeated the process over a hundred times every day. It was a rare occasion for him to detain anyone. When the last person from the steamship passed his station, he tallied his marks and turned in his report to the head immigration inspector. Donning his hat, he left for home. First, he planned to stop at O’Malley’s for a pint to wash the stench of hundreds of unwashed bodies from his nostrils. Two hours later, he climbed the stairs to the set of rooms he shared with his widowed sister, Irene. He could smell the warm, yeasty scent of his sister’s bread when he entered the flat. He hung his hat and coat on a nail by the door. “Irene, the angels in heaven envy me,” Thomas said. He sat at the table and Irene put a bowl of stew in front of him. He grabbed a slice of the bread and dipped it into the stew. “And why is that?” Irene asked. She blew a stray curl from her eyes. “This load was mostly Germans and Norwegians. Different faces and accents, but the same look of confused hope on the lot of them.” Thomas mopped up the last of the stew with his bread. Irene’s husband, Daniel, had died the previous year when he fell into machinery at the factory where he worked. They had only been married six months. Thomas worried his sister would never remarry despite her attractive face and excellent cooking skills. 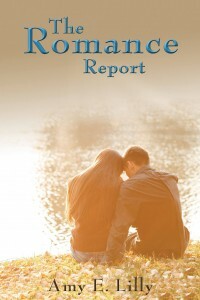 The last thing Irene needed was to think Daniel would come back to her as a spirit. “I don’t believe in ghosts and such. It’s not natural. The dead go to heaven or hell. They don’t wait around for some grifter to help them speak,” Thomas said. “Well, I’m excited,” Irene declared, “and I don’t care what you say, Thomas Sullivan. My Daniel will come. Just you wait and see!” She snatched his empty bowl from the table and stalked away. Thomas sighed. He knew his sister. Once she had an idea in her head, nothing could shake it loose. Tired from his long day, he headed to bed. “So much foolishness. Folks with too much money and time on their hands and not enough sense. Madame Valentina, as she calls herself, is here. She’s waiting for her men to finish setting up the room.” Mrs. Hudson placed a plate with a generous slice of roast and vegetables in front of him. “Anne tried to tell her the same thing,” Mrs. Hudson said. She pulled a pie from the cupboard and sliced a generous portion. She slid it onto his plate. The door between the kitchen and hallway swung open. Anne and Irene rushed into the kitchen giggling. The dishes they carried threatened to topple to the ground. Thomas jumped up and relieved Anne of several plates. “Thank you, Thomas.” Anne blushed. A plump blonde girl, Anne Hudson always had a smile on her face. Thomas sipped his coffee. He was opening his mouth to ask Mrs. Hudson if he could call on Anne when Irene burst into the kitchen. “What in the world…” Thomas started to protest, but Irene had already darted back down the hall. Thomas quickly followed her down the hallway to the sitting room. A dark-haired woman with a lace shawl draped over her head sat at a round table. Anne and Irene were the only other people in the room. Thomas stumbled out of the room and rushed back to the kitchen. He shivered despite the warmth of the room. The next day, Thomas yawned his way through his shift at Ellis Island. Irene and he hadn’t arrived home until close to midnight. Irene had chattered about the séance nonstop. Daniel hadn’t spoken to Irene, but she thought maybe he had sent the warning to Thomas. “Do you know a burnt man?” Irene had asked. “No, I don’t. Nor do I need to stop anyone based on a psychic’s warning. It’s all fakery. Madame Valentina was warming up for her upcoming performance,” Thomas had replied. He struggled to focus on the man in front of him. Mr. Manning had warned all the inspectors of a credible threat. Thomas eyed the man in front of him. An immigrant from Greece, his information appeared to be in order. He nodded, and the man moved forward. He was the last passenger. When Thomas opened the door to his home, the familiar scents and sounds that usually greeted him were absent. He found Irene sitting at the table crying. Thomas was shocked. Madame Valentina had said she didn’t have much time. Did she have a vision that she was going to die? He shook his head. What a silly thought. She had probably meant that she had to hurry because it was time for the séance. Her murder was a coincidence. “Who killed her?” Thomas asked his sister. “They haven’t arrested anyone.” Irene sniffled. “The circumstances were strange. She left the Granvilles shortly after midnight. Mr. Giles said she was alive when she climbed into the carriage. By the time she arrived at her hotel, she was dead. Stabbed through the heart! The police questioned the driver. According to him, he never stopped between the Granvilles and the hotel. He had no blood on him, so the police believe him. This is awful.” She pressed a handkerchief to her mouth and tried to calm down. “She promised to try to channel Daniel for me. Now I’ll never have a chance to speak to him!” Irene wailed. She ran from kitchen and slammed her bedroom door shut behind her. Thomas considered going after Irene but decided to let her be. The emotions of women baffled him at times. Clearly, dinner wouldn’t be appearing, so he put his hat back on and went in search of a corner pub and a cold pint. On Monday, Thomas reported to work as usual. He and Irene had passed Sunday with nothing more said about the murder of Madame Valentina. They attended church a few blocks from their home and ate a cold supper before they retired to bed early. The passengers disembarking today had left the port of Le Havre in Italy three weeks ago. All of the inspectors were alert to the possibility that one of these passengers could be planning an attack similar to the bombings throughout the city in the previous year. Ellis Island, or the Island of Tears as the immigrants called it, was the gateway, and Lady Liberty reigned as gatekeeper; however, it was the immigration inspectors who ensured those allowed through were worthy. The majority of the passengers filing past Thomas were women and children. A few men had passed through his station earlier, but none of them had seemed suspicious. He gave the old woman in front of him a smile. Her daughter and son-in-law were already settled in Brooklyn. She was finally coming to join them and her new grandchild. He approved her entry, and she nodded her thanks. The next passenger stepped up to the station. He wore a gray cap pulled low. “Take off your cap,” Thomas said in exasperation. Surely the translators had explained the inspection process to the man. The man reached up and pulled off his hat. Thomas tried to hide his shock at the man’s appearance. Angry scars mottled the side of his face and twisted his mouth into a permanent grim smile. “Fire. Burned my face,” the man said in broken English. Thomas froze as Madame Valentina’s warning about the burnt man filled his thoughts. It had to be a coincidence. He scanned the manifest for the man’s name. “Mi scusi. I pass?” The man gestured towards the gate. “Um…no. Wait.” Thomas held up his hand to stop the man. He wondered if he was foolish to believe a scam artist’s warning about a burnt man. He could lose his job if he was wrong. Before he could decide, the man pushed past him and began to run. “Stop him!” Thomas shouted. He ran after the fleeing man. The old Italian grandmother was still shuffling towards the exit. At his shout, she turned. Seeing the man running towards her, she screamed and dropped her small bag. The burnt man stumbled but quickly regained his footing. It was all Thomas needed. He leapt forward and tackled him. Two weeks later, Thomas and Irene sat at their kitchen table. Irene listened as Thomas read the news article aloud. “Where are you going?” Thomas asked. They usually spent their Sunday afternoons relaxing. If the weather was nice like today, they would walk to the park and feed the ducks. “Mr. Giles asked if I would walk with him in the park today. I said yes.” Irene turned to grab her hat but not before Thomas saw the tinge of pink on her cheeks. “I think that’s a fine idea,” Thomas said. 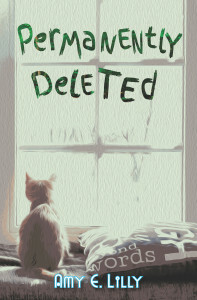 This is an UNEDITED ADVANCE of Chapter One of Permanently Deleted, Book Three in the Phee Jefferson Series. I was seated at the circulation desk in the library checking in the large cart of books next to me. I wanted to get everything done and shelved before I went home in a few minutes. The last patron was packing up to leave when Juliet burst through the front doors. “Phee, you’ve got to come,” Juliet panted. I sat back and tried to process what Juliet’s news. Nellie Jo arrested for murder? There had to be a mistake. Ever since Juliet helped me solve Elody Campbell’s murder, she saw crime everywhere she looked. Poor Mr. Crum resorted to walking his dog in the predawn hours to avoid Juliet’s watchful gaze. She swore he didn’t use a pooper scooper when he walked his Schnauzer. “Alright. Give me five minutes to shut everything down and lock up. We’ll head over to the sheriff’s office and talk to Lu. I’m sure it’s a misunderstanding.” I shut the computer down and grabbed my sweater and purse. Juliet paced in front of the exit as I flipped off all of the lights and locked the doors. “Nellie won’t do well in prison. She’s too sweet and trusting,” Juliet blurted. “I’ve got about two hundred dollars in savings to help with bail money. Do you think Mom and Dad will chip in?” Juliet jogged down the sidewalk towards the sheriff’s. “Wait until we talk to Jaime before you break open your piggy bank,” I said, huffing as my short legs struggled to catch up with Juliet’s long stride. Juliet ignored me and burst through the glass door of the sheriff’s office. Tina looked up from where she sat flipping through a gossip magazine. “Where’s Nellie? Why was she arrested? Lu?” Juliet’s eyes darted around the small front office until they lighted on Lu who had come out of her office in the back. “Settle down,” Lu said, holding up her hands defensively. “Settle down? Settle down? Clint slapped cuffs on Nellie like she was a common criminal and you want me to settle down?” Juliet shouted. The door to the sheriff’s flew open behind us. Valerie, Corinne and Charlie marched in and demanded to know where Nellie was and why she was under arrest. I couldn’t figure out who was saying what as voices rose in volume. “No need to shoot anyone,” Clint drawled as he walked into the reception area. “Nellie is not under arrest. I didn’t cuff her. She’s here voluntarily to answer some questions about Mike. You all need to go home and let the police do their job.” He looked pointedly at Juliet and then turned his gaze towards me. 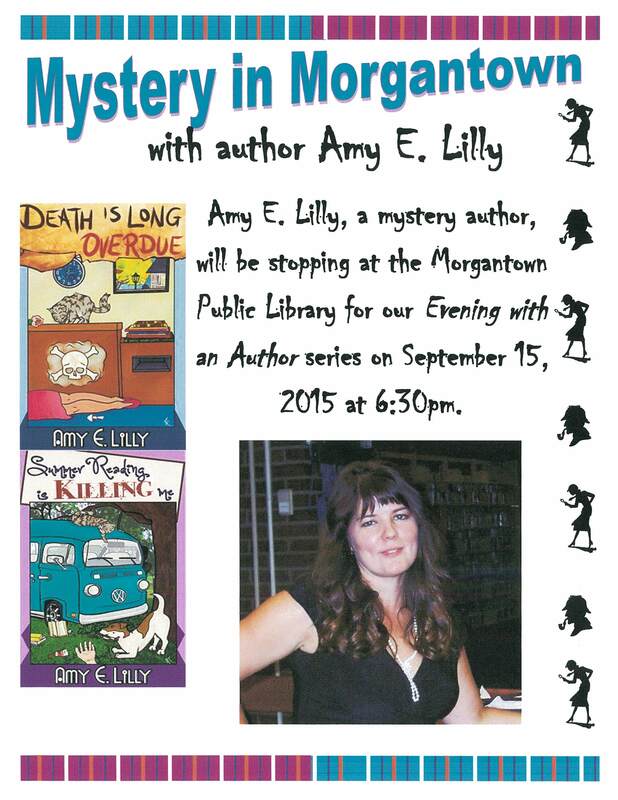 Author Reading in Morgantown – September 15th at 6:30 p.m.